Our weather has been phenomenal this past week which has made me extra giddy to start seeing my colorful tulip flowers start to appear in my front yard. 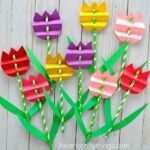 Whether you are looking to make a colorful spring kids craft or are on the hunt for a darling flower craft to make for a special Mother’s Day gift, this darling paper tulip flower craft is perfect. The mixture of the tulips popping of the page in a 3D effect and the bright, vibrant colors makes this paper tulip flower craft a show stopper. Watch the full tutorial of us making this gorgeous 3D paper tulip craft before you get started. Don’t forget to subscribe to our YouTube channel so you never miss a new video! 1. Print out the paper tulip flower craft template on your colored cardstock and cut out each of the template pieces. You could also print out the template on white paper and color the template pieces. 2. 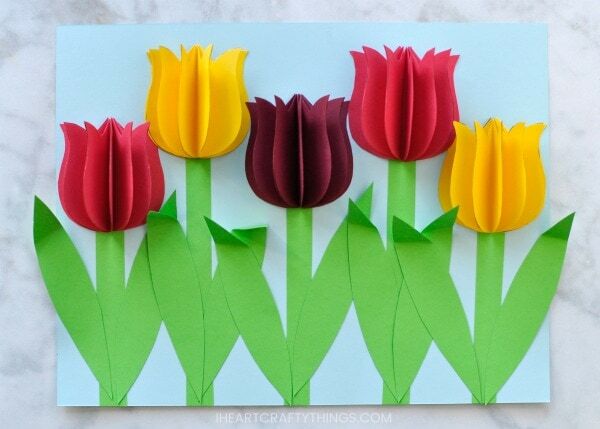 Fold each of the six paper tulip flowers in half. Use your glue stick to add glue to one of the folded halves of a paper tulip. Then glue another half onto it. Continue adding glue and adding a paper tulip flower until all six have been glued together, creating a 3D paper tulip. 3. 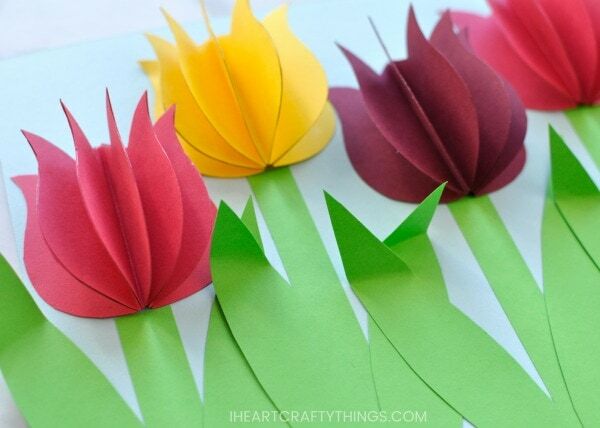 Create as many 3D paper tulips as you’d like to use in your paper tulip flower craft. Then glue each of the paper tulips across your blue cardstock, varying the height of each flower. 4. 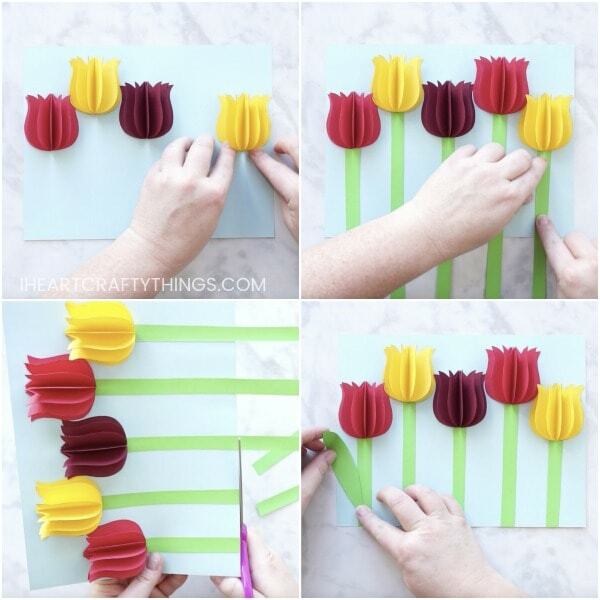 Cut out stems for each of your paper tulips. Glue them at the base of each of your flowers. Then use scissors to trim off any stems that are hanging over the bottom of your blue cardstock. 5. Glue two stems onto each of your paper tulips. To give your flower craft some extra dimension, fold down some of the tops of the stems. Your paper tulip flower craft is complete! The 3D paper tulip flowers pop off the page to make this craft visually interesting and beautiful! Looking for more gorgeous flower crafts? 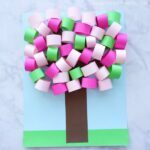 This paper flowers bouquet craft is another beautiful option for a sweet Mother’s Day gift. Use an empty water bottle as a stamper and create this gorgeous Hyacinth flower craft. Here is another simple way to fold paper circles to create a 3D paper sunflower craft. 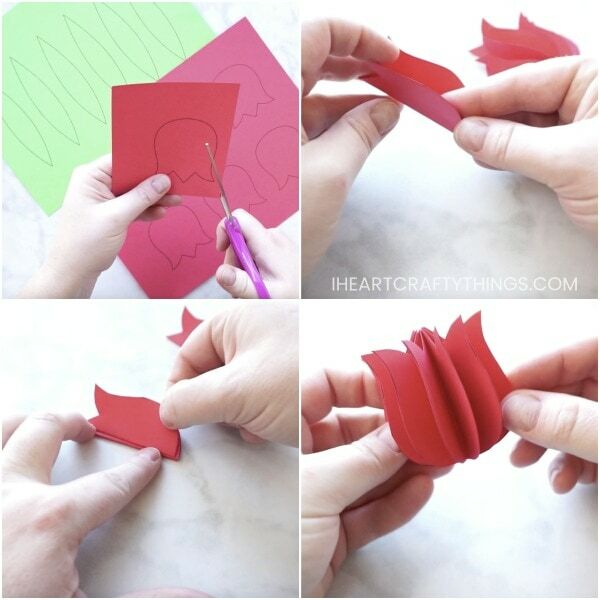 Use this 3D Tulip technique to create a darling heart card for Mother’s Day! Can this be made with construction paper. Definitely! You might want to use less than 6 of the flower templates per flower, depending on the thickness of the construction paper. 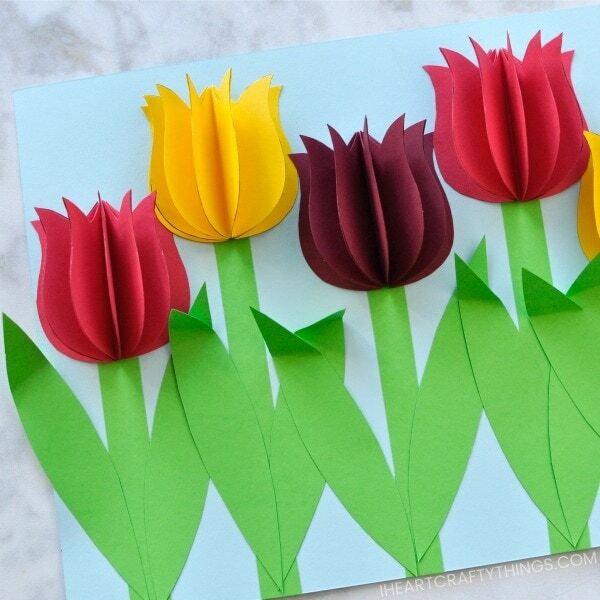 I feel very love a 3D paper tulip because they are so pretty and easy to done.Thank you for the guide of 3D paper tulip. 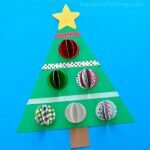 Great ideas for all ages. Very adaptable.